Dan Mabry, employee of The Hiller Companies, is a General Products technician who found himself in the position of saving a life during a fiery crash at a gas station. He will be honored by Escambia Fire Rescue at their annual awards ceremony. The Hiller Companies has announced that Dan Mabry, due to his quick thinking and fire safety training, will be honored by Escambia County Fire Rescue later this year for his act of heroism. When Dan Mabry drove to work on Friday, June 26, 2015, he thought it was just another day. Looking forward to the weekend, he had no idea that in a matter of minutes, he would come upon a dangerous accident and save a man’s life. Mabry’s actions have been recognized by Escambia County Fire Rescue. 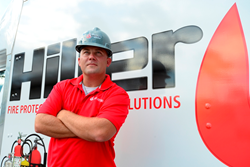 The Hiller Companies offer fire protection products and services that are preserving lives and property all around the world. Headquartered in Mobile, Alabama, Hiller extends its reach globally as well as in domestic markets with offices in Alabama, Florida, Louisiana, Massachusetts, South Carolina, Texas and Virginia. We are proud to safeguard everything from small businesses to nuclear testing facilities, yachts to aircraft carriers, and gas stations to offshore platforms.